Every year, we know Spring has come when Momar, the Marsupial, makes his first appearance. He slowly made his way up to the feeder and ate the seeds on the ground. Possums are very slow moving and can’t seem to run. The way they react to danger is to feign death by ‘playing possum’. 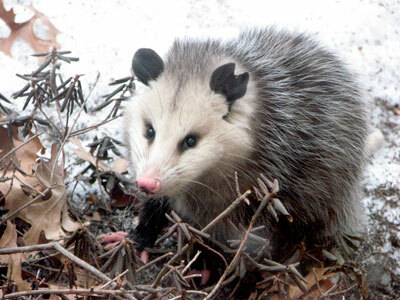 Possums (short for opossum) are built for comfort – not speed. 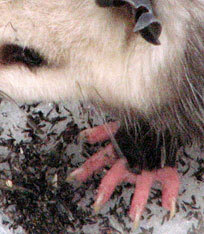 Opossums have claws on all fingers fore and hind except on the two thumbs. I noticed that Momar had a tattered ear and wondered with whom he had had an altercation. He didn’t seem any worse for the wear. A few days later, Momar was in a life and death situation. Two black labs were making their way over from the pond as Momar slowly made his way down the path. I flew into action, ran down the stairs and out the back door. At that point, Momar was already ‘playing possum’ as the lab was heading right towards him. I screamed at the dogs and they were startled and ran away.